Calcium is the most abundant mineral in the body, with 99 % found in bones and teeth. The remaining one percent is responsible for strengthening cell membranes. Calcium supports the nervous system, hormone formations and proper blood clotting. Research continues to point to calcium deficiency as the primary cause of osteoporosis, the demineralization of bones. Osteoporosis occurs mostly in postmenopausal women, causing approximately 200,000 deaths a year, more than claimed by cancer of the breast, cervix and uterus combined! This condition referred to as “brittle bones” seems to be the result of a diet deficient over a period of years in calcium, compounded by a lower absorption of this essential element due to aging digestive organs. With the support of medical research, the market has been flooded with calcium supplements, many which fail to take into consideration calcium metabolism. A mineral that is not absorbed cannot get into the bones; it just floats in the blood stream and then forms deposits in the joints. The amount absorbed is more important than the quantity consumed. An interesting study found that calcium from bone meal/powder is absorbed 1.13 times more than calcium carbonate, the variety found in most supplements. 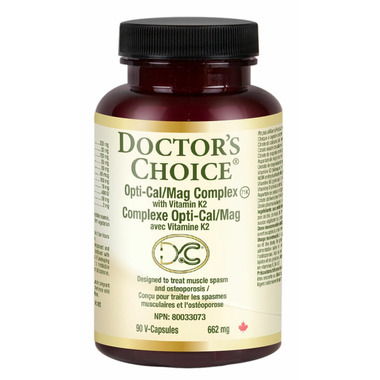 Medical research has shown that the addition of calcium supplements to the diet can restore strength to the bones, particularly when the calcium is balanced with minerals that enhance the absorption and utilization of this important element, as in our Opti-Cal/Mag Complex with Vitamin K2.